New York, NY. Publisher: C.M. Plumb & Co.. Editor: Charles M. Plumb. 1/1, November 1864-1/10, August 1865. 32pp. 6 x 9. $2.00 a year (plus 12 cents postage), 20 cents a copy. This succeeded A.J. Davis's Herald of Progress, but probably only in the sense that Plumb agreed to fulfill the unexpired subscriptions of Davis's failed journal. (Plumb, by 1879 at least, was Davis's brother-in-law.) In turn, its offices were taken over on its demise by the Banner of Light, which also hired Plumb's clerk and opened a bookstore there under the name William White & Co. 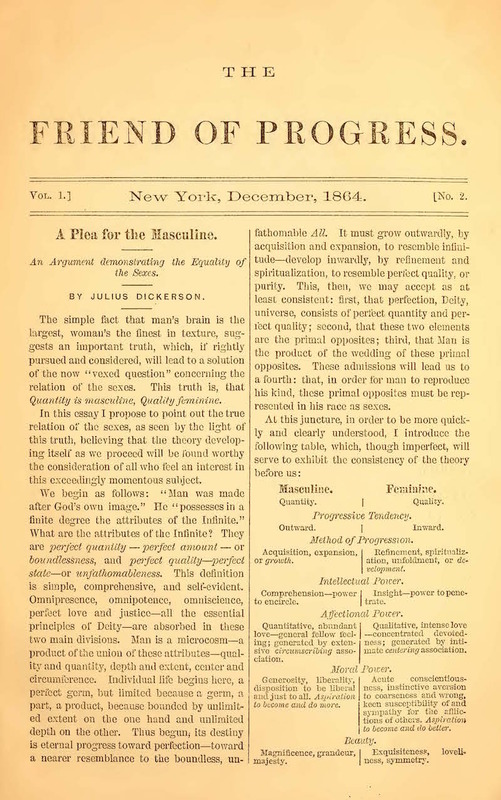 The journal was more explicitly devoted to reform than its predecessor, with articles by Julius Dickerson ("A Plea for the Masculine: An Argument Demonstrating the Equality of the Sexes"), O.B. Frothingham, E.C. Towne, John Weiss, and J.K. Ingalls, but carried a smatteriing of spiritualist materials, such as a review of "Mr. Sludge the Medium" (Browning's poem on D.D. Home), Cora L.V. Hatch, and A.J. Davis's touching "My Father's Withdrawal from Earth" (which mentions, intriguingly, that his father was a constant and wide reader-a fact which may reflect on the relationship of Davis to Swedenborg, and certainly strikes sparks from the conventional image of Davis as uneducated and illiterate). The journal also published several articles by Mrs. Louise Pollack ("L.P.") on the progress of the first kindergarten in America. See "Kindergarten Comes to America," online at http://www.spirithistory.com/kinder.html. Plumb was a Canal Street printer and occasional publisher of spiritualist books who advertised "Mrs. Plumb's Academy: Normal Institute of Physical Culture in New York" in the pages of the journal. NYPL.